Join us for a live panel discussion and film presentation featuring those who worked behind the scenes to fabricate and install Ugo Rondinone’s Seven Magic Mountains. 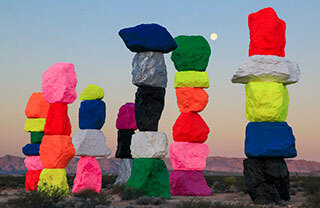 A discussion led by the Nevada Museum of Art’s Director of Communications, Amanda Horn, will include a behind the scenes peek at the installation of the monumental public artwork, Seven Magic Mountains in the Las Vegas desert. Hear from the Museum’s Curator of Contemporary Art, JoAnne Northrup; Director of the Center for Art + Environment, Bill Fox; and other important guests who made this work possible.